Hi. I have been following the blog for about 1 year now and I have seen a few posts about 1.01-backers getting burned or having to go through a gut-wrenching reversal before getting their cent. I find all those examples interesting and have two questions. First, why are you so negative on these backers e.g. "hurrah, hurrah"? Second, by only showing the spectacular losses and never pointing out the frequent, boring wins you are not giving a fair (RoC) treatment of the strategy? I believe that it can be very profitable when paying attention to the right factors (like investment grade credit investing) and a good psychological fit for a certain type of people. Thanks. That's fair comment. The 'hurrah, hurrah' part actually related to a song I'd been listening to this morning, an old song by The Jam, so it follows the tune. But yes I do cheer when 1.01s get beaten. 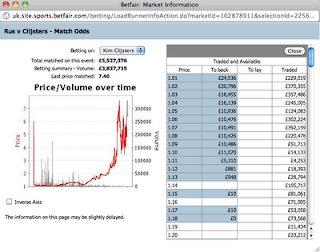 Surely 'frequent, boring wins' can be achieved with far less risk by trading one tick briefly at a much higher price? Just one going wrong in 101 markets and all you can do is break square at best. Betting circles over the years have been littered with leviathan punters who took the short odds for huge sums with win after win after win.... then it all went pear-shaped and they ended up selling used cars or the Big Issue. In the States, they call them Bridge Jumpers (where they'll end up if it loses). In Australia, we call them bank teller bets - when a horse called Ajax in the 1930s would run, it was so good it would start very long odds-on. Bank tellers would take all the cash out of their drawer on a Friday night, take it to the racetrack, take home the 'interest' and put the money back in the drawer on Monday morning. When Ajax got beaten one day at 1-40, the brown stuff hit the fan. No doubt there is someone who can make it work but the cost of just one mistake is just far too high. 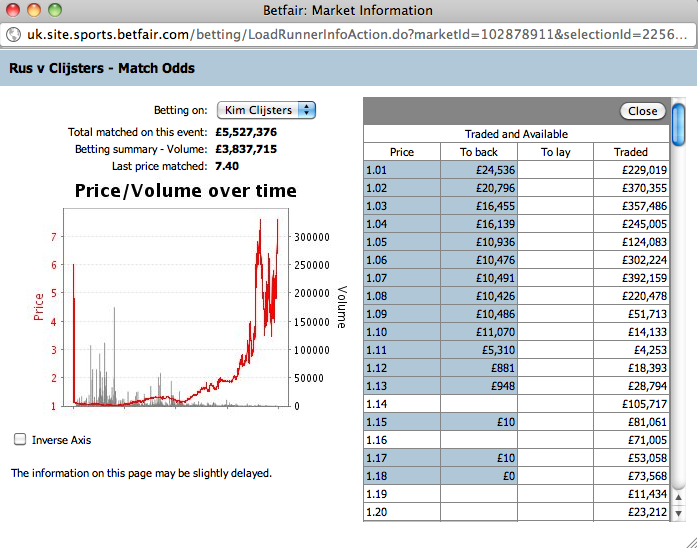 At least if you were backing 1.02 shots on Betfair, there'd be an upside you could cash in on (lay 1.01) without sweating a result. Backing 1.01 leaves nothing to chance. I'm an 'educate the masses' guy. There will always be an exception to my advice but I'm trying to stop people falling into traps (eg thinking 1.01 always equals sure thing) and using their brains to find a strategy which suits them.